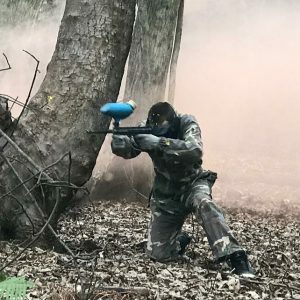 North London Paintball & kids paintball. Paintballing in North London. Our North London Paintbal site sits just a few miles North of the M25. Woodland based, we’re in Newgate Street Village just North of Potters Bar, Enfield and Barnet. The site offers easy access from the M25, A1M and A10. Formally Warren Wood Paintball, this is now one of RW Paintball’s own sites. 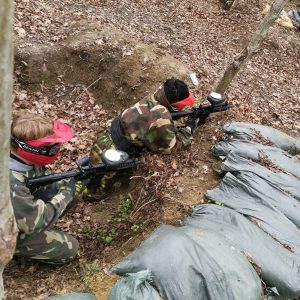 For adults and teenagers we offer high power paintball games across a number of exciting playing zones. 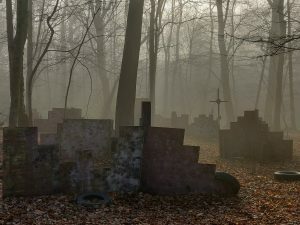 Our Church field, seen here, can be unnerving at the best of times. Bring on a cold foggy day and you’ll feel the chill whilst you go about the task of raising all flag stations. Paintball ambush alley- there’s nowhere to hide. Someone is going to have to be brave and lead the charge. Let’s hope you work well as a team and can cover your lead soldier. Our 500 paintball pack is usually plenty for a half day but there are packages to suit every pocket. You’ll probably use a few hundred more if you stay the full session. If you need more paint, there will be plenty available to buy on the day. Just book in, pack some snacks and gloves, and we’ll deliver you an amazing fun packed day of paintball. More information on adult paintball and booking can be fond here. Our North London site focuses on the adult game but can also offer low impact for 8-11 year olds on select dates. If we cannot offer your dates, we have a partner site just a few miles away so get in touch. The woodland based experience is great for getting the kids out of London. A low impact game, usually set over 2 hrs, is perfect for birthday parties and other occasions. A feeling of ‘real life fortnite’ will wash over them as they negotiate our playing zones and try not to get shot. We usually ask for minimum group sizes of 10 but feel free to give us a call if you have fewer. We’ll try and fit you in with other groups where possible. More information on kids paintball and booking can be found here.